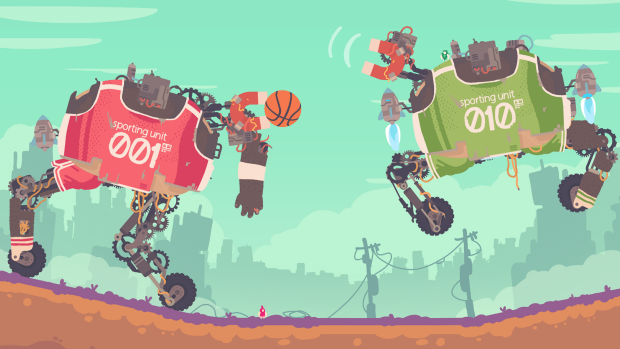 We’ve been working on updating Regular Human Basketball for the new millennium, and bringing it to Steam! It’s still a ways off, but look out for it in 2018! We’re taking it to Pax Aus this weekend, and a few weeks later Barney’s bringing it to San Fransisco for Day of the Devs, we’ll have a stack of controllers for some 4 on 4 ballin’ so come along if you can! Amazing news, guys. Can’t wait to see it on Steam. Will there ever be multiplayer for Crawl? Oooh boy, color me excited. Are you by any chance planning for a GOG release of HRB as well? Awesome 🙂 We’re planning a Steam only launch, mainly because it’ll make online matchmaking a load easier to develop. Ah, I see. Bit of a shame, but it makes sense. Oh, my god, this is such an awesome game! I played it at PAX Aus and it blew me away. I live in Taiwan now, and I would love to translate your game into Chinese so my friends here could enjoy it as well! Love this game, will it still support 5 on 5 matches though? I notice you just mention 4 on 4 in the post there. Yeah 5 on 5 (or more) will still be supported, we only had 8 controllers though, plus we found it hard to fit more than 8 people around a screen when exhibiting since people stand closer than at home! Is there any way you could put any form of RHB on Switch. Please. It would be perfect. I wasn’t planning to originally, but the Crawl switch port was fairly painless so I’m definitely considering it now. We’ll concentrate on the steam release first and see how things go from there. Has anyone had luck getting the Steam controller to work with the Mac app? Or should I just wait for the Steam release? I think I did the controller input for it before I had access to a Steam controller, so I wouldn’t be surprised if it doesn’t work. Probably best to wait for the Steam release, or map the controller inputs to keyboard buttons maybe.